A Thought Before You Swat! 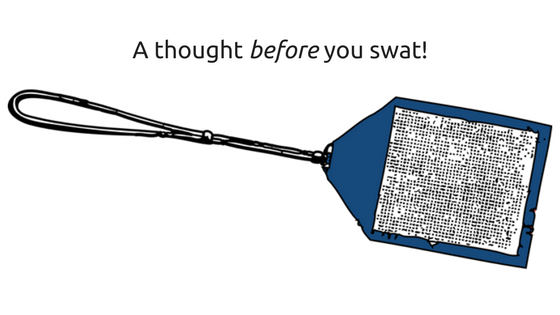 > Blog > News > A Thought Before You Swat! Are you accidentally killing natures own exterminators? Drop that shoe! Not every pest deserves a trip to Squash City. In today’s blog we’ll explore a few little guys (and ladies) that are worth keeping around. Here’s the Good, the Bad, and the Bugly. Some bugs pose health risks to your family while others are simply annoying. Bear in mind, however, that not all creatures are created equal. Plenty of insects provide substantial benefits to the environment and your home. Once we look past their creepy crawly exteriors, we discover that as long as they stay outside, these insects deserve a lot of respect, and even a ride out on a magazine. Spiders and ex-felons share a lot in common: their bad stigma makes it impossible to find a good job. This reputation is often undeserved, especially for spiders. Even though they are classified as predators, few species found in Canada represent a health threat. In reality, these eight-legged critters assist in controlling other pests in the home or garden. Studies indicate that spiders kill more bugs than any other predator combined. And, unlike ex-felons, they work for free and decline paid vacations. Get to know which spiders are dangerous, like black widows and brown recluses. If you see a harmless looking spider in your home, slip on a thick glove and release it outdoors. An effective technique for capturing spiders is to place a cup over the spider and then slide a piece of paper underneath to entrap it. Mr. Spider will thank you for it, and continue to loyally provide his amazing pro-bono services, eating everyone in sight, except you. You might be wondering, why are ladybugs important? Ladybugs fill many important roles in nature, and being mega hungry is one of them. Ladybugs typically don’t wander indoors, but when they do, they can be gently escorted out. To ensure they stay outdoors you can seal cracks around doors, screens, and windows. In addition to eating her weight in bugs many times over, ladybugs are known to bring good luck. According to Chinese tradition, when a ladybug lands on you, it’s considered a sign that you will be granted more patience and fewer burdens. We know it’s nice to say grace before a meal, and if there’s one insect that is truly thankful, it’s the Praying Mantis. Mr. and Mrs. Mantis are a fascinating insect to have around the garden, and if one happens to pop into your home for a visit, he or she deserves to live another day. That’s because the mantis will eat nearly anything – including its own kind! It consumes most pest insects and is particularly good at controlling mosquitoes and mites. How’s that for natural pest control? Some human mantis fans have even reported cases in which a mantis has eaten raw meat from a human hand! In an intriguing twist of bug trivia, it is the only known insect that can turn its head and look over its shoulder. The next time you catch a mantis staring your way, don’t get bugged out. Just say, Bon appetite, and he’ll keep munching your pest problems away. Got bug questions? We’ve got answers! For safe, effective, and fast pest elimination contact us for a free quote. Premier Pest Management works hard to take care of your family, home and business. Your pest problems = our solutions. Until next time!